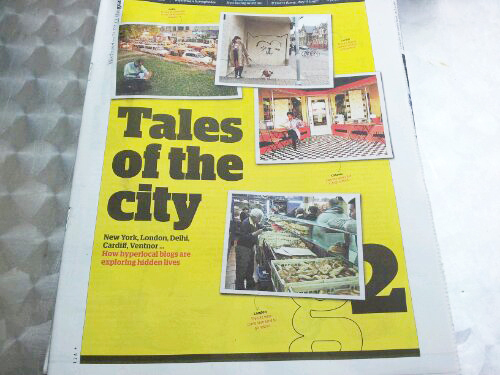 In March 2012, The Delhi Walla was discovered by the Guardian, one of the world’s most respected English newspapers. 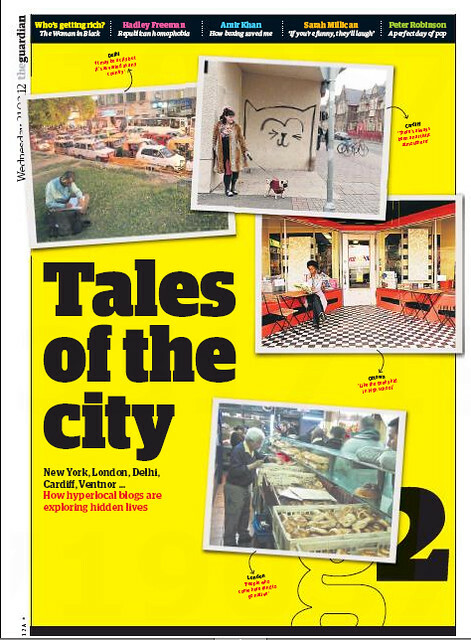 The Delhi Walla was featured with five blogs based in New York City, Cardiff (Wales), Isle of Wright (England), Portland (USA) and Ottawa (Canada) respectively. Here’s the link. Here’s the complete text, written by Patrick Barkham, author of The Butterfly Isles – A Summer in Search of Our Emperors and Admirals and a feature writer for the Guardian. “There is a rich pile of hyperlocal blogs run by dedicated volunteers across the country but digital storytelling – giving voice to local people and telling of their relationship with their town or city in the tradition of the Gentle Author – is surprisingly scarce. It is happening in some locations, however. Five years ago, Mayank Austen Soofi (that’s me! ), “a small-town guy” from Uttar Pradesh, was a frustrated writer working as a waiter in a five-star hotel in Delhi. Daily excursions into his new city were his escape; he wrote about the city to understand it himself and The Delhi Walla blog, created in his local library, was the result. A celebration of the food, culture and books of India’s capital, it aims to profile 1% of Delhi’s 11 million population. “Each seems to live in a different Delhi. To have a fleeting sense of their personal Delhis makes me appreciate the nuances of my Delhi,” he says. His approach is similar to the Gentle Author in that he eschews negativity and criticism. “I write without intending to be provocative,” he said in an interview with Rediff.com. “I don’t like writing bad things about people. No point.” He has started a reading club called The Delhi Proustians, written four guidebooks and a new book will be published by Penguin India later this year. “I think it’s the best narrative non-fiction to have come out of India after Mala Sen’s excellent India’s Bandit Queen. You see, I don’t fake modesty,” he says. Dismayed by the stereotypical portrayal of Cardiff as a city for hen and stag dos and sporting events, freelance writer Helia Phoenix and her friends Adam Chard, a designer and photographer, and Simon Bradwick, a web developer, set up We Are Cardiff in 2010. Phoenix was inspired by Julie Michelle, the aspiring photographer behind I Live Here: SF, a blog about local residents of San Francisco (currently in abeyance after Michelle’s partner suffered a stroke). We Are Cardiff tells the stories of ordinary Cardiff folk, from korfball player Terry Matthews to Dan Allsobrook, an IT consultant and allotment-lover. Some, such as English student Alice Paetel, give paeans of praise to “the nature that surrounds the city so tightly” while others, such as music producer Lee Marshall, lament the replacement of “a colony of weird and fascinating shops like a coral reef” with “another identikit franchise”. Most importantly, says Phoenix, the people who are featured can write their own life story – an antidote to the way that mainstream media interviews are often spun. We Are Cardiff is now making a documentary based on some of its 60 interviewees. Phoenix is a great admirer of Spitalfields Life but is not puzzled why more blogs don’t follow its lead. “I’m not surprised that more people don’t do it because it’s too time-consuming,” she says. A thriving hyperlocal site on the Isle of Wight has helped promote Mr Caulkhead, a mysterious character who has been broadcasting fantastic audio shorts about the island’s local dialect. Using a telephone and ipadio (free software enabling people to stream audio via a phone live to the web), Mr Caulkhead has broadcast his Colloquialisms over the internet – weird words in a thick local accent that are accompanied by an amusing story illustrating the word’s usage. Ventnor Blog also published his broadcasts alongside illustrations by a local artist. The result is a warm, witty history that could only ever work online. Mr Caulkhead had a prolific run of words last winter but sadly has not broadcast an episode for a year, although he was on Twitter recently promising some more words for his adoring audience. When the new book (apocryphally, THE Delhi book) comes out later this year, I hope IndiaTimes.com will be on flat-50 sale at the time. well done bhai. Having spent time in creating the solid base, rise now will be exponential 🙂 Best luck. Yaaaaayyyy!!! You ought to get such results. Congratulations Mayank. You deserve it.